I love The Beast from 20,000 Fathoms. I suppose in retrospect, it is a pretty middling ’50s monster picture, the stock romance, quirky scientist, and radioactive dinosaur in tow. But, Beast is important. It signaled the dawn of a film era dominated by monsters, Godzilla rose from the Beast’s death throes, solidifying the genre as a Hollywood staple, and deeply affected an impressionable, dinosaur-loving child of the ’80s. More importantly, it solidified Ray Harryhausen as a deserving legend. 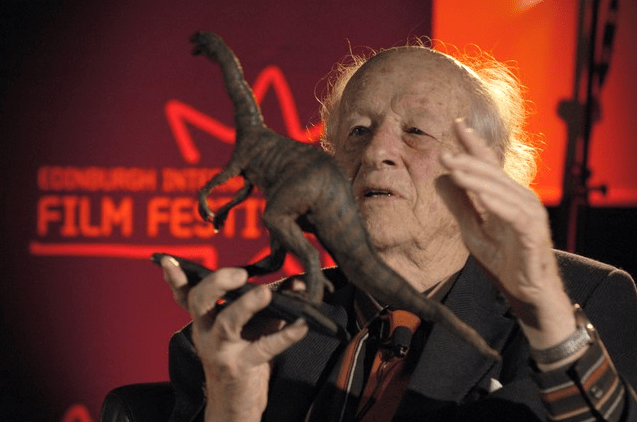 Harryhausen died today at age 92. Most people will remember Ray for Jason & and the Argonauts, a spectacle of stop motion wizardry as the hero tramples a series of living skeletons in one of Hollywood’s most triumphant finales. I still look back at Beast – picturing in my mind a young mentor of King Kong’s stop motion craftsman Willis O’Brien – patiently moving a model of a fictional lizard rampaging through New York. That’s Hollywood at its more endearing. Harryhausen didn’t sit behind a computer. He didn’t have help making his monsters move. There was one person listed during the end credits. The stories of his unimaginable patience will never see enough exposure. The guiding hand brought his monsters to life in a way that made you feel as if you knew the man behind them. Yes, even 50-foot tall, lighthouse smashing dinosaurs with a penchant for eating police officers. His creations were his own, not the result of a team, not the result of a producer’s multi-million dollar check, but sheer will and the love of what he did. I feel like I just did this. In fact, I sort of did. Last month, Roger Ebert passed away. He was one of two celebrities I could cling to. When I needed some inspiration, I could flip through an Ebert review and find the spark I needed. When I needed a pick-me-up, I could pop in a Harryhausen movie and admire someone who never once lessened from the peak of his career. I can still do both of those things, but it won’t be the same. There will never be another Beast, and Ebert will never pen his thoughts on the latest summer explosion fest or small indie picture. I’ll never have a chance to meet or speak to one of them either, and that’s deflating. I suppose this shouldn’t be personal either; maybe it’s selfish that I’m writing about personal experiences instead of everything Harryhausen did. But, I feel now, no more than an hour after the news broke, that I have to get it out. Chances are, I’ll put things on hold too just so I can admire Beast from 20,000 Fathoms again too. It just feels right.